The equipment of this Set is identical , with the "Compact" type, excepting the Cabinet, which is made of specially-selected American Black Walnut of elaborate design and finish. 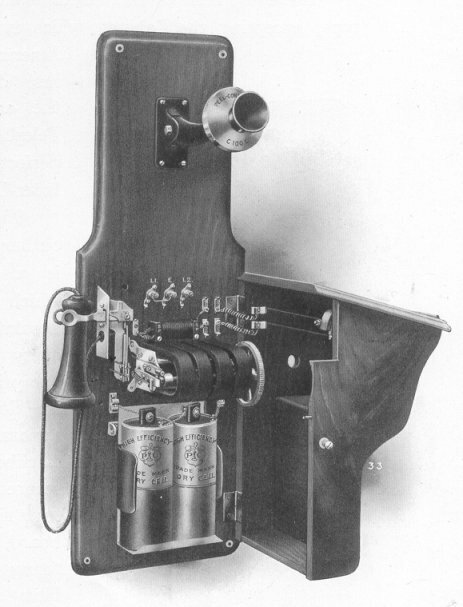 It is the acme of an up - to - date Telephone, and represents a perfect instrument for City and Inter-Urban Installations. Fig. 11 shows the general outline, and particular attention is also directed to Fig. 12, which forcibly portrays the absolute ease of access to every working part. With the exception of the Ringer - which is fitted in the Box - all apparatus is mounted on the Backboard. The Generator is secured by machine screws passing right through the Backboard, which ensures a perfect fixing and eliminates the possibility of its working loose, either in shipment or during ordinary service. 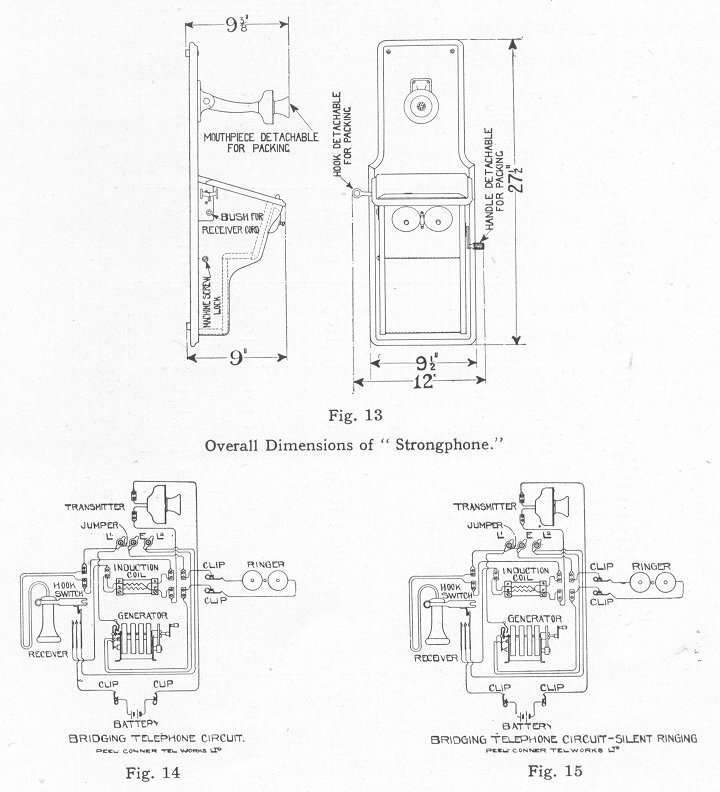 The Hook Switch is our standard model with detachable Switch lever, and the whole front of the Telephone in which the Ringer is mounted can be lifted off, if desired, by simply removing the Ringer connections from the Terminals. Distance Pieces or Feet are placed at each corner at the rear of the Backboard, which keeps the set away from damp walls, thus preserving the Cabinet Work and Apparatus. Line Terminals are mounted on the Backboard inside the Cabinet, and no Lightning Arrester is supplied, as we deem it best to mount this directly on the Line (Our C100 Protector, illustrated on page 32, represents an ideal piece of apparatus for this purpose). 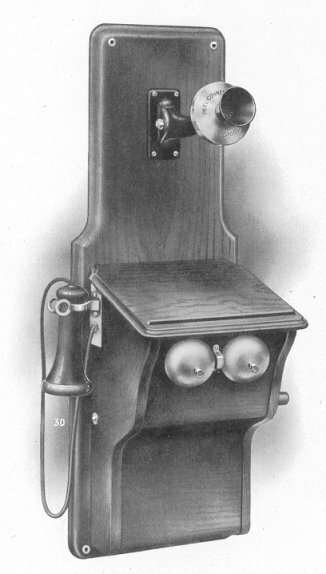 We make the above Telephone in one size only (see Fig. 13) and equip it as a Bridging Set with either a 4-Magnet Generator and a 1000 ohm Ringer, or 5-Magnet Generator and 1600 ohm Ringer. The Circuit is our standard shown in Fig. 14, or, if silent ringing is required, as per Fig. 15. Telephones wired to either circuit may be changed over by merely altering the connection on the Generator: no additional wiring is required.